If the recent drop in temperatures and merciless wind are any indication of what's to come this winter, we're in for a long, cold season. And if you're like me, this weather is anything but enjoyable. Between the incessant time spent inside and the pain endured in the frigid outdoors while in transit, coming down with a case of the winter blues is almost always inevitable. Contrary to popular belief, however, there is a cure which does not require a prescription. All one simply needs to do is to head down to SK-II Boutique Spa for a truly healing experience. The therapists at SK-II are far better (and friendlier) than any doctor I've ever paid a visit to and this becomes apparent immediately upon entering their Seoul branch, nestled on the periphery of Doosan Park in luxurious Cheongdam-dong. After being greeted warmly and led to the reception area, guests are treated to a cup of tea while treatments are explained and customized to fit their preferences. And although their services are mostly limited to facials and massages, there's an option to make even the pickiest spa-snob satisfied. 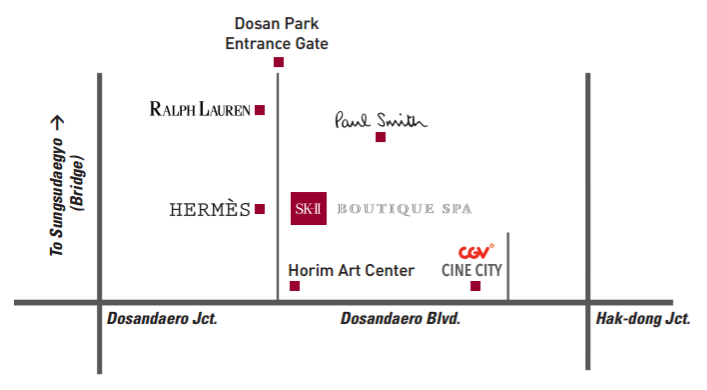 In need of some winter relief and a good pampering session, I recently paid two visits to SK-II Boutique Spa. On my first visit, I opted for the LXP Royal Program (₩330,000). This 100 minute treatment includes a foot bath, LXP Massage (facial), body stretching and a scalp treatment. Customers can choose from three kinds of facials and considering that this would be my first time using SK-II's skin care products, the receptionist recommended I try the Prestige Revival Massage. Revival... just what I needed! The brochure noted that this specific facial "instantly provides your skin with ample moisture and nutrition by using a pitera mask and the best LXP massage of SK-II, which contains highly enriched pitera." For those that are wondering, much like I was at the time, pitera is a liquid produced in the fermentation process of yeast and is often regarded as the key to clear skin by women across Asia. A recent search on SK-II's website revealed that these masks retail for $95 USD, so considering this, the price of the package is really a steal. The VIP Room on the 4th floor created a calming environment. Low lights and soothing music set the mood as I changed into a robe and settled in for my foot bath. My therapist, Serena, added fragrant bath salts to the water as she gently massaged oils into my legs and worked the knots out of my abused feet. Communicating in English throughout the entirety of the session, she directed me to the bed for the facial. Being heated and extremely comfy, it invited sleep, but I was determined to stay awake to enjoy it. And by golly, I did. Serena began the facial by cleansing my skin. After opening my pores with a steam machine, the typical multi-step Korean skin care process began. Toners, serums and creams were layered before that famous pitera mask was placed on top. In fact, one of the best things about SK-II Boutique Spa is that they use their own products, so you know exactly what's being used on your skin. And it's common knowledge that SK-II's skin care line is the very best in Asia, if not the world. While the mask worked its magic, Serena treated me to a massage, moving from my back and shoulders to my arms and hands, constantly checking to ensure the pressure and stretching weren't too much. She finished off the treatment with a scalp massage, in which she applied oil to my hair. This is essential during the Korean winter, when everything gets dry. The only problem, however, was that I had an appointment just after the session and didn't have time to wash my hair. So, those booking this session should be sure they don't have plans afterwards. Serena wrapped up the session and after changing back into my clothes, I was brought back into the beautiful lobby for a spot of tea and a slice of cheesecake while taking in the pretty Christmas decorations. I checked out my skin and noticed that it was glowing! Never in my life have I seen my skin glow, so I was shocked. This effect lasted a few days and I was very much content with the moisture boost the facial gave my skin. I was eager to see if the next treatment would be just as amazing. And of course it was. Repeating the same process as the day before, I was briefed on the Body Lux Relaxing Program (₩275,000), a treatment promising to "detoxify the body from stress and fatigue and activate the lymphatic circulation, eliminating swelling." This option includes a body pack that can be added to the body part of the customer's choice. I was brought to a treatment room that was less luxurious than the previous day's, but it was just as clean and relaxing with the same kind of heated bed. My therapist, Sun, spoke English just as well and was very attentive to my needs. Beginning with my legs and working up to my arms and shoulders, Sun lightly scrubbed my skin with an exfoliant before massaging my muscles with aromatic oils. I was surprised that a woman so small could be so strong! Mid-massage, she added the body pack to my stomach. Yes, my stomach... I know it sounds strange and although I'm sure most people choose their shoulders or legs for this option, I had watched a video just a week before explaining that a tummy massage greatly helps with pain and digestion. The process was slightly uncomfortable but in the end, my stomach did feel better. I'll admit that I don't always treat my body well and because I spend a lot of time behind a computer screen and carrying heavy bags around the city, my back and shoulders are in a constant state of tension. So, having these neglected muscles worked out felt like heaven. By the end of the 90 minutes, which can only be described as religious, I walked out the treatment room feeling like I had a brand new body. I was once again given a sweet treat- this time, a waffle- and some tea and was also provided with a gift that included a few skin care samples as well as a body loofah and a ₩30,000 discount coupon for my next visit. All international guests are treated to this nice little surprise, which makes one's visit that much better. SK-II Boutique Spa is truly an oasis and the treatments were just what I needed to feel revived and refreshed. And considering the luxurious facilities, unrivaled customer service and professional staff, this spa is unquestionably the best value for the price in all of Seoul. So, do yourself a favor and get yourself a treatment at SK-II Boutique Spa. Your body and mind will thank you for it. And for those winter blues? Well, they don't even stand a chance. Reservations: By e-mail (click here). The spa operates strictly on first-reserved, first-served basis, and weekdays tend to be less crowded than weekends. They do not accept reservations that are more than 6 months in advance. To Get There: All nearby subway stations require a 20-30 minute walk. As such, it is advised that visitors take a taxi from Sinsa Station (Line 3), Apgujeong Station (Line 3), Gangnam-gu Office Station (Line 7) or Hak-dong Station (Line 7). Click here for a map and additional directions. Disclaimer: Although the services mentioned in this post were provided free of charge by SK-II Boutique Spa, the opinions are, of course, my own. Words and photos by Mimsie Ladner of Seoul Searching. Content may not be reproduced unless authorized. Change in temperature not only brings changes in moods but also limits our mobility and to avoid this it is a good thinking that the cusomers will be provided cloths and the services of physiotherapist under one roof. A soothing and relaxing style of best foot massager therapy using smooth, heated volcanic basalt stones and sometimes cold marble stones as well. Heat has a calming, and soothing effect for the giving hot stones massage it's relaxing quality.